Anawangin and Calaguas have a new rival. Thanks to social media, Fortune Island is now benefiting from the huge surge of popularity beach camping is enjoying. Fortune Island is located off the coast of Nasugbu, Batangas. The breathtakingly beautiful 27 hectare island boasts of long stretch of mixed white and coral sand, clear blue and lush greens. But, what is catching the attention of most travelers are the grecian pillars, which is the most photographed feature of the island. 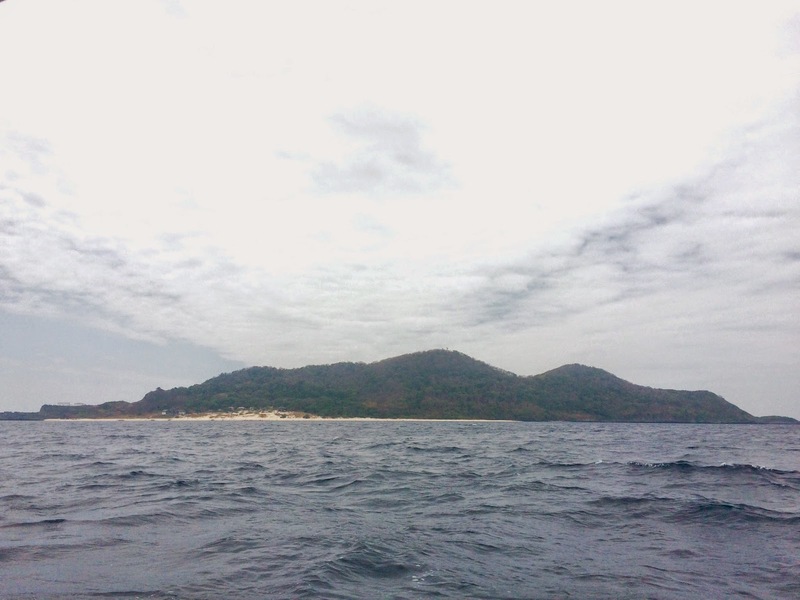 The island was long owned by former Batangas Province governor Jose Antonio Leviste. Fortune Island Resort Club was a membership resort, which featured a salt-water swimming pool, clubhouse, cabana, basketball court, helipad, rest houses and the acropolis with grecian pillars and statues on the edge of the island. The island was in the news in 1992 when the shipwreck of the galleon San Diego, which sunk in the 1600s, was discovered by a French underwater archeologist. Because of some questions on the ownership of Leviste, the local government office took control of the island and has been allowing tourists to visit for a fixed rate of P 400.00 for overnight trips and P 350.00 for day trips. We took the Coastal Road - Cavitex - A. Soriano - Ternate Nasugbu Route, which passes through the towns of Naic, Maragondon and traverses through the Kaybiang Tunnel. We were supposed to meet-up our contact, Gino (0935 232 8738. not highly recommended though) at Jollibee in Nasugbu but he was assisting another group. He just instructed us to go to Wawawee Resort, which is owned by his in-laws. Before we went there, we passed by the public market for our two day provisions. By the way, there were boat representatives in front of Jollibee, where Fortune Island tours can be arranged. We paid Gino P 3,500.00 for the boat and gave him additional P 500.00 as tip. As mentioned, we waited for our boat ride to Fortune Island at Wawawee. That was where we also bought our other supplies like drinking water and of course, beer. It was an eventful 2 hour boat ride because of the rough seas. Our boat even stalled twice. We didn't mind because we knew paradise awaits and we were not disappointed. We chose the far end of the island to set-up camp. There were already campers in some of the best spots in the island, but we also found a good, quiet one. Since it was lunch time, we decided to prepare our meals first, before exploring the rest of the island. Guests of the island should be ready to rough it out. There are no rooms here for accommodation. There are also no stores nor restaurants. There is a comfort room though that uses only seawater to flush, so do not expect it to be really clean. After an afternoon nap, it was time to explore. Of course, we headed to the grecian pillars. It was late afternoon, close to sunset, so we had lovely colors. It is also good to climb up the acropolis at dawn. We returned to our camp before the sun sets and passed by other popular features of the island like this monument, which contains the remains of a woman found during the construction of the island's resort and the wreck of a replica of ship used as the resort's restaurant. The best part in any beach camping experience for me is when we all find the best spot to sit down, drink beers and exchange stories, without a campfire of course. We try to minimize our impact on the places we visit. Another thing I like about beach camping is waking up to this. We had a really quiet morning, spent admiring this. After breakfast, we went swimming. The island was declared a marine reserve in 1978 so expect colorful marine life. Good thing we had good, sunny weather after a bit of a shower early morning. We chose to swim at this part of the island. We agreed to leave the island before lunch. It was a longer boat ride and it was a much rougher sea. We washed up at Wawawee and paid the resort owner P 500.00, which was actually for table rental. We just had to rush because the videokes surrounding us was causing us headaches. We took another route back to Manila. We passed by Tagaytay, Aguinaldo Highway, Roxas Blvd., then EDSA. Or was it SLEX? I was asleep. Some campers are leaving behind a lot of trash on the beach. We even found a busted light bulb on our campsite. Since we practice LNT (leave no trace), we decided to pack all our trash and our boatmen initially refused to carry it back with us to Nasugbu. The lack of respect is a loss, not just for the island, but for all of us. The tourism office of Nasugbu should do something about this. Campers, especially tour organizers, should be more sensitive. We saw Fortune Island as it is because it was not accessible for the longest time. Let us not make everyone regret opening up the island to everybody.